Header Graphics – How to add, edit and change. Header Graphics are an important part of each and every page, as they are the first thing that browsers see once they have loaded a page. 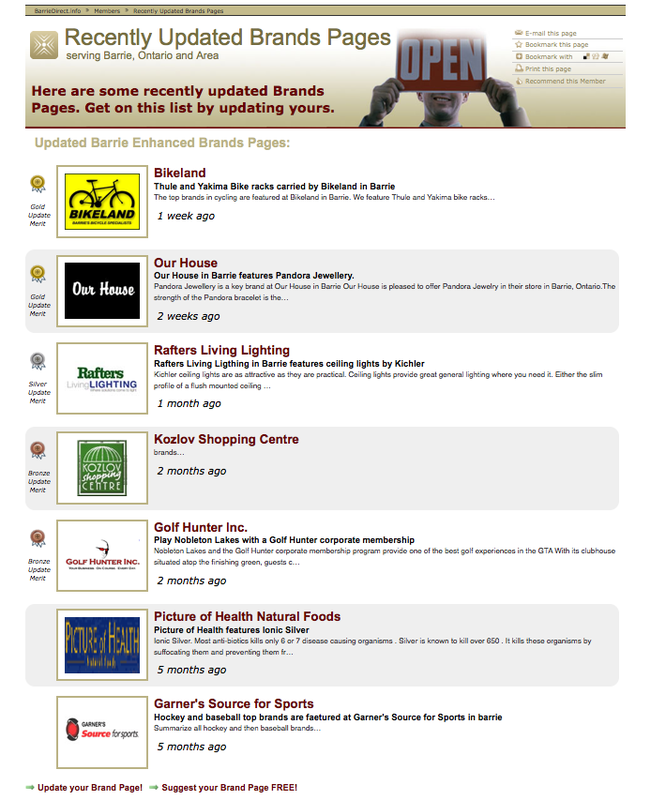 Organizations who have recently updated their Brands Pages are now listed together on one page. The recently updated pages are organized in two ways. 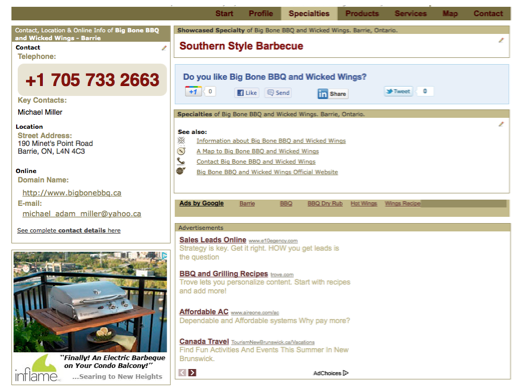 First, they are separated by Enhanced and Basic Brands Pages. 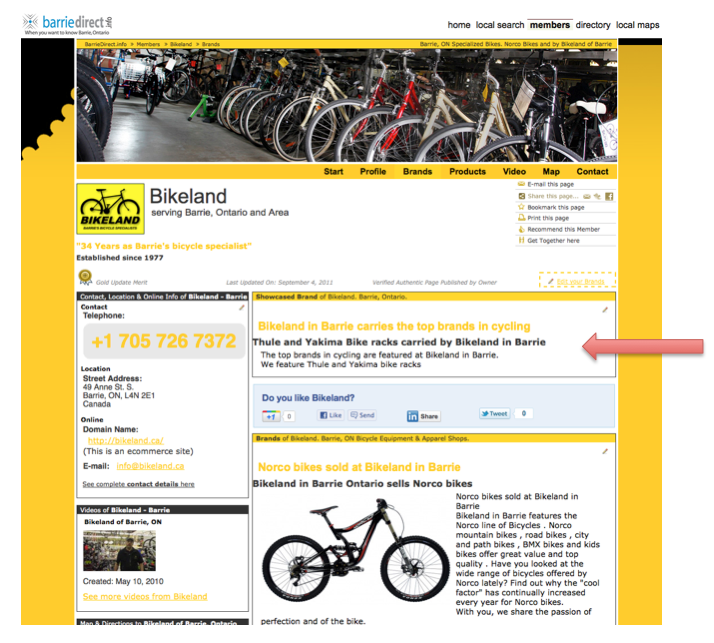 Recently updated Enhanced Brands Pages come first, followed by the recently updated Basic Brands Pages. The recently updated Brands Pages are then broken down by the date and time of the last update. The most recent updates are found at the top of the category. 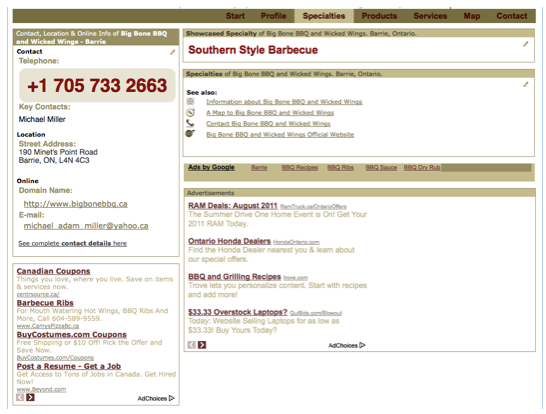 However, Enhanced Brands Pages always come first, no matter how recently updated the Basic Brands Pages are. Kozlov Shopping Centre would come before Glass Lighting Gallery because it is in the Enhanced Brands Page category. 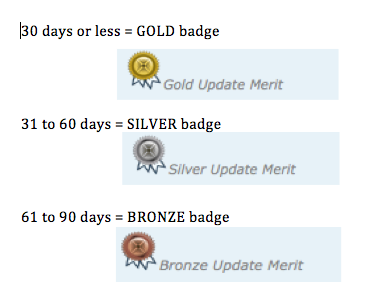 Merit badges: Merit badges are placed on the left hand side of your logo and reflect how recent the update was with a gold, silver or bronze badge. Time of last update: The time of the last update is shown so that everyone knows how recently your page was updated! Headline and subhead: The first Headline and first Subheading from the Brands Page are pulled into this list to provide more information about the organization. This also creates consistency between pages. 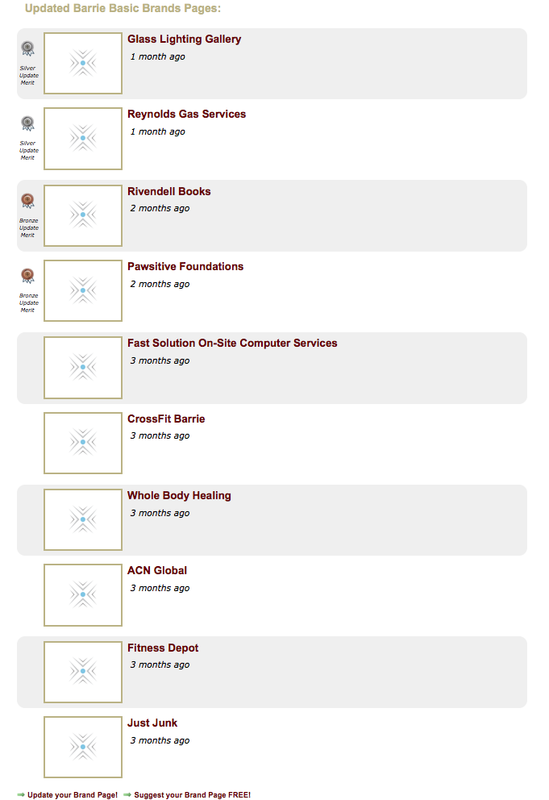 There is a maximum of 20 organizations in the list for recently updated Brands Pages: 10 Enhanced Brands Pages, and 10 Basic Brands Pages. Organizations can get their names on this list simply by updating their Brands Page. The more your Brands Page is updated, the more your name can be featured on this list! 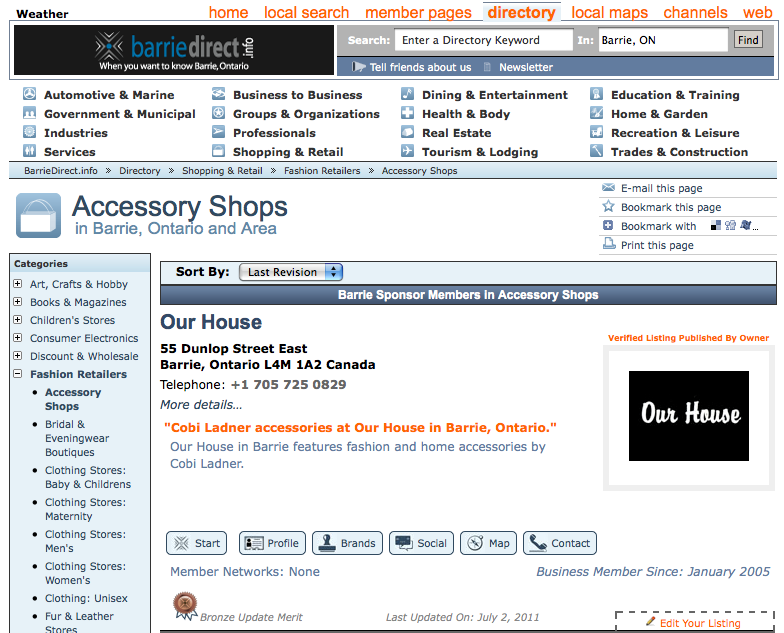 Our House in Barrie, Ontario – a seller of unique gifts, jewellery, and home accessories – is doing a fantastic job with their website provided by www.BarrieDirect.info. 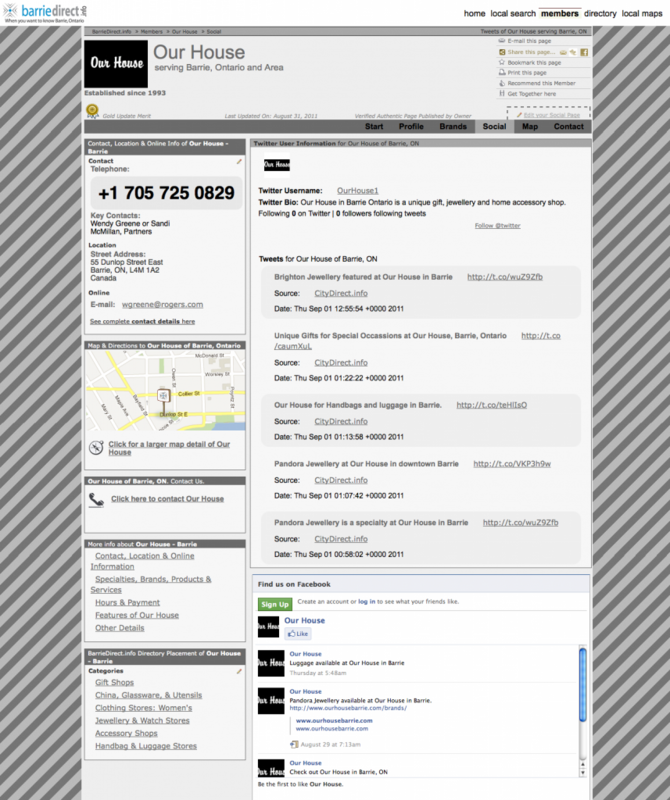 - Enhanced Pages: Our House opted to Enhance their Start Page Package (with Map and Contact pages). They also Enhanced their Profile, Brands, and Social Pages. By doing so, they have unlocked the full power of each page offering. - Graphic Design: Our House worked well with their CityDirect.info Marketing Specialist to communicate a look and feel to our in-house graphic designers. Our designers executed design that reinforced the brand image of Our House – upscale and sophisticated, focused on women who care about classic, long lasting style. 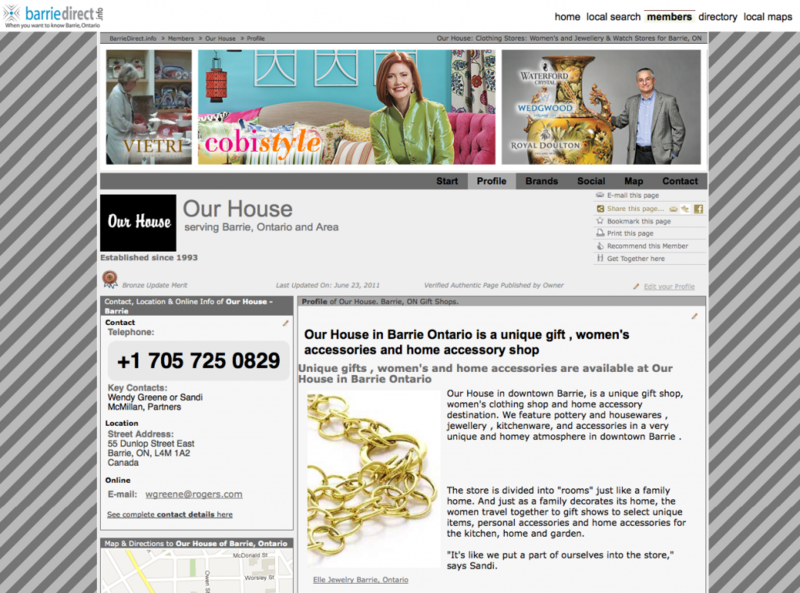 - Domain and Hosting: With the domain name OurHouseBarrie.com, and hosting provided through BarrieDirect.info, Our House is sure to benefit from superior reliability and the ease of dealing with one provider of online marketing solutions. 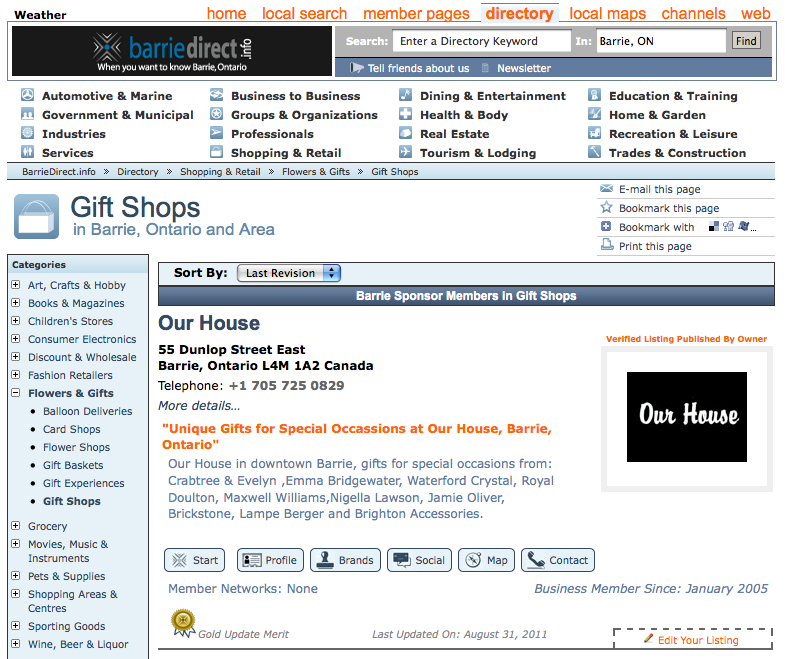 - Local Directory: Being part of Barrie, Ontario’s premier local business directory and CitySite, Our House benefits from having their virtual storefront (their website) and their listings within BarrieDirect.info’s local network – which significantly increases qualified visits and improves search engine optimization (SEO). #1 and #2 result from their Start Page and Profile Page respectively. 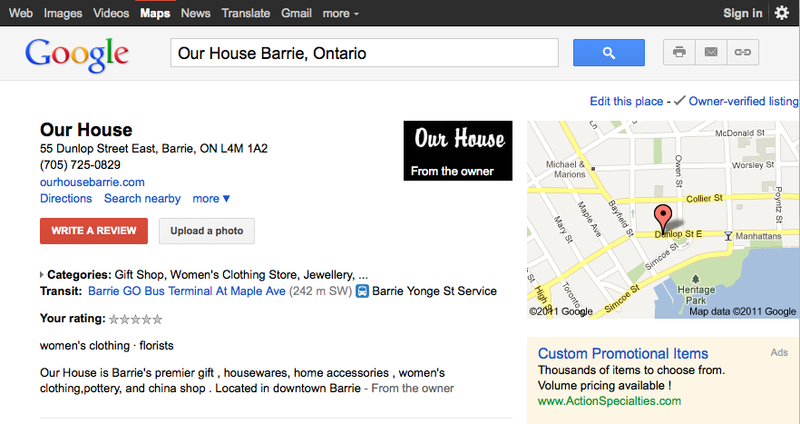 – Our House knows how important Google has become to local business. They also understand that such an important aspect of their marketing should be managed by experts if they are to remain competitive. Therefore, Our House uses the expert services of CityDirect.info to not only properly setup and optimize their local account but to keep them optimized as the rules of the game continue to change. – Our House realizes that the Internet is a powerful tool to spread word of mouth. They know that social networks like Twitter and Facebook are now used as much as search engines. By harnessing a Social Page through BarrieDirect.info they not only are able to quickly and easily share information with their audience, but also save time and effort – because their Social Page allows them to place messages into Facebook, Twitter and LinkedIn all at once. – By working with their CityDirect.info Marketing Specialist and by making good use of www.BarrieDirect.info, Our House not only has built an impressive online presence, but has focused it directly at their target market. Colors schemes are available on the Enhanced versions of CityDirect.info pages. The easiest way to log in to change your color scheme is to sign-in to your Account Overview in Centerpointe. 3. Select the satellite button beside the color scheme that you want to use. 4. Scroll down to the bottom and select “Save Changes…” Remember, Centrepointe sessions time out after 45 min. Show your contribution on all of your Pages! With the addition of “Last Updated On” date and Merit Badges onto product pages, Business Members are now being encouraged to update more than just their Listings. Placing this date on each Product Page lets users see how current the information is on each individual page. This being said, the Merit Badges also change from page to page, depending on the date of the last update. The “Verified Authentic Page Published by Owner” label identifies pages that are managed and maintained by actual businesses and organizations. Similar to the “Verified Listings Published by Owner”, this label builds trust, credibility and shows that you are paying attention to your listings. By clicking on the pencil icon, Business Members are prompted to login to their account and are then taken directly to the part of Centrepointe that allows them to edit the content associated with the placement of the pencil. For example, clicking on the pencil in the Contact section of the page, will take the Business Member to the form in Centrepointe that edits the details of the Organization Location, including location and contact information. We have finally added access to Video, Social, Specialties, Brands, Products, and Services to the Listings on the Directory Pages for Business Members. Enhanced Listings will have new icons, in an updated style. The Basic Listings for Business Members now have more links, and for the first time, icons as well!